I am trying to display a single word inside a larger text area as bold. (Silly requirements.) I have not been able to figure out if there is a way to do this within a standard express. So far all my research has turned up is that I should try to turn markup on for that text box and use HTML markup. Although, even that only has a limited set of supported tags. First I needed to turn markup on for the textbox. Here are the instructions I found on this asp.net forum answer. If the Toolbox is not visible, click Toolbox on the View menu. Double-click or drag a Textbox report item to the design surface. Drag a field from your dataset into the text box. A placeholder is created for your field. Right-click the placeholder (<>), and then click Placeholder Properties. On the General tab, verify that the Value box contains an expression that evaluates to the field you dropped in step 3. Click HTML – Interpret HTML tags as styles. This causes the field to be evaluated as HTML. 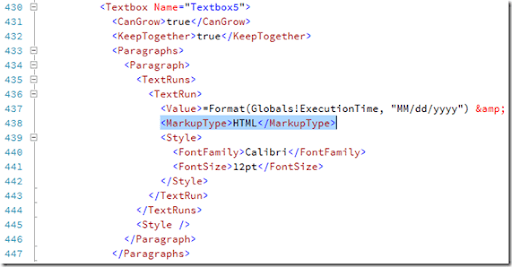 To manually change it without using the UI tools add the tag “HTML” into the xml. Finally, I rewrote the text in the textbox to be formatted with html instead of the rdlc formatting. It was a pain to do but in the end will be more flexible and maintainable.